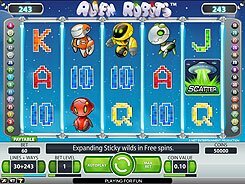 Alien Robots is a NetEnt-powered slot played over 5 reels and 30 paylines. 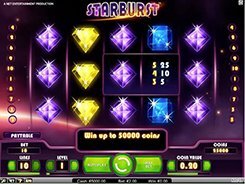 Unique to this slot is an optionally activated 243 ways to win model that works in addition to 30 paylines. 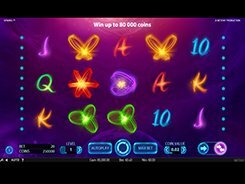 So you may get a win for hitting three or more identical symbols on an active payline AND for hitting the same combo on adjacent reels starting at the utmost left reel. A coin value is adjusted from $0.01 to $0.5, with the maximum bet reaching $150 per spin. On the reels you will come across various robots and poker cards from 10 to Ace that look stylishly pixelated. The highest fixed jackpot you can win in the game is $50,000 if you land five Red Robots across an active payline. Besides, you will get extra $7500 for that combo if playing with 243 bet ways activated. 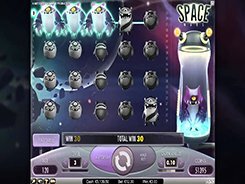 The slot features a scatter symbol (the Flying Saucer), with 3+ unlocking up to 50 retriggerable free spins. 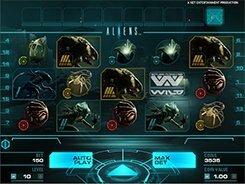 During the free spins feature a normal wild symbol will become an Expanded Sticky wild. 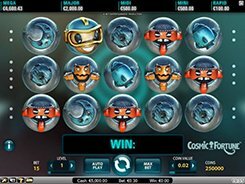 Should a wild symbol appear on the reels during the free spins, it will expand up and down to cover all three symbol positions and will be held in place while the remaining reels respin one time at no extra cost for you.